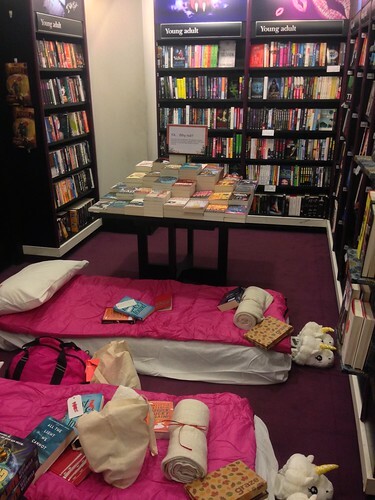 As you’ll already know, N and I were guests at Friday night’s Waterstones Sleepover event at their flagship branch in Piccadilly… and it was the best sleepover I’ve ever been to! 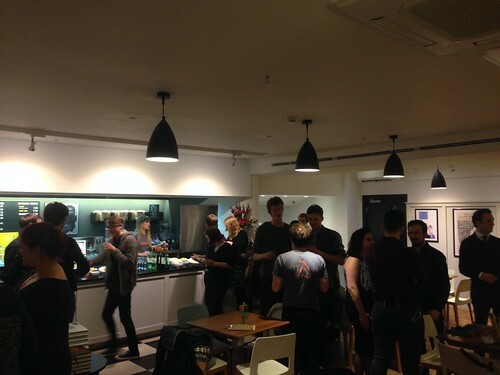 We got there a few minutes before 9PM, pyjamas in hand, and were greeted by the Waterstones and Airbnb teams. They had a spread of drinks and nibbles laid out while winners and their guests mingled and got to know each other. 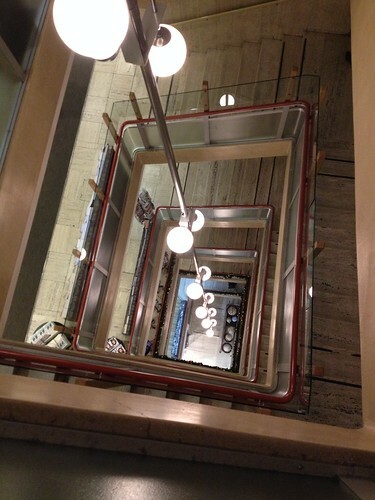 After a bit of a housekeeping chat (fire exits and the like), the Waterstones crew took us on an extensive tour of the shop, pointing out interesting architectural quirks and giving us a history of the building. Before Waterstones, the building was a department store called Simpsons which was used as inspiration for the long running British series Are You Being Served? (my grandmother loves that show). 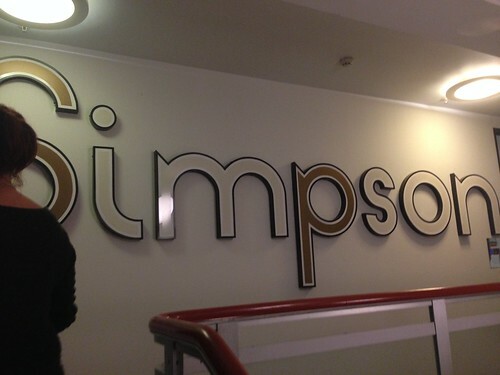 The building is listed, meaning it’s a protected site–and that includes the old Simpsons sign which is on display up in the HQ offices on the upper levels. Cool, no? Also, the light fitting that runs down the main staircase is listed (and amazing), so anytime a lightbulb blows they have to get planning permission to change it. Crazy! 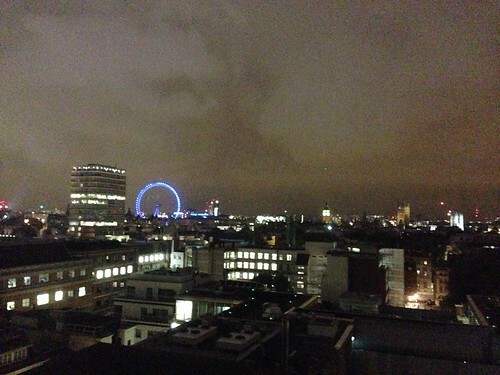 We got to briefly check out Waterstones HQ but the highlight was the view–something not a lot of people get to see. Sorry for the slightly grainy/blurry photos… we only had our camera phones. But you get the idea. As we headed back down, we were stopped by a Poirot lookalike who read us a chapter from the new Monogram Murders by Sophie Hannah. Very intriguing, indeed! After Poirot’s departure, another dapper fellow joined us… P.G. Wodehouse’s much loved character, Jeeves! Jeeves read us a portion of the newly compiled book of short stories, Jeeves and the Yuletide Spirit and Other Stories. Very funny! We were coming up to midnight and starting to get a bit peckish. 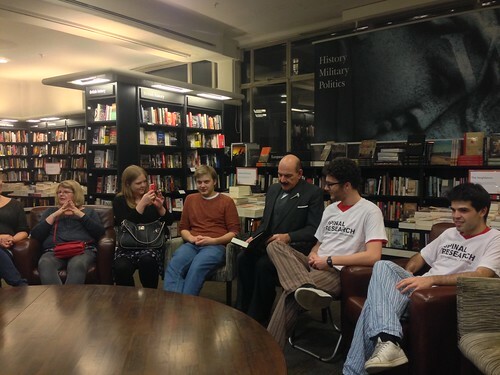 Thankfully Waterstones had us covered with a load of pizza, snacks and drinks waiting for us after our tour and visits from Poirot and Jeeves. After munching for a bit, there was yet another treat in store for us. 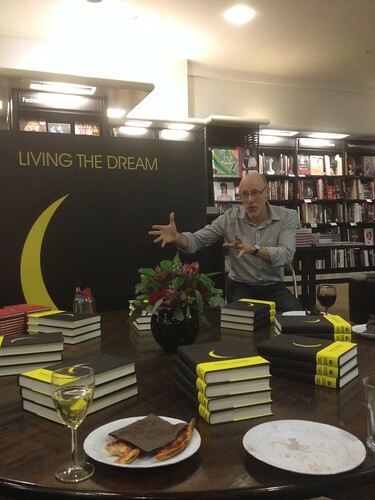 Professor Richard Wiseman chatted with us about sleep disorders, dreaming and how to get a good night’s sleep. 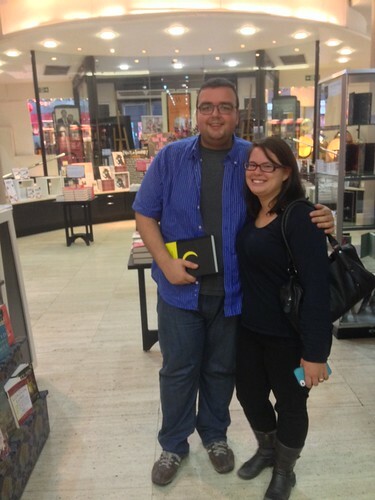 He was so interesting and engaging that N picked up a copy of his newest book, Night School, to take home. I have a feeling we’ll be fighting over it (and my younger sister D has already called dibs on it when I go home to visit in a few weeks)! Finally, the moment had arrived. 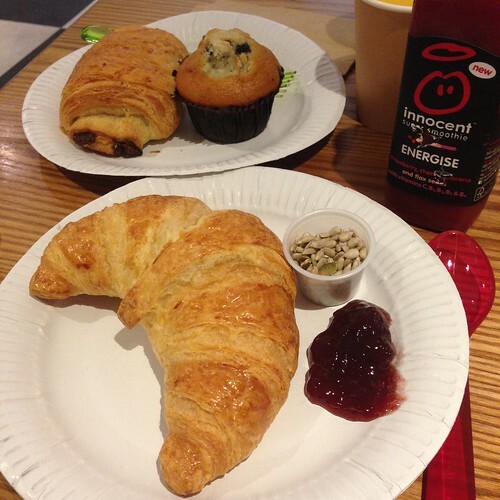 We were going to see our sleeping area, change into our pyjamas and our reign of the store was to begin! Our camp was set up in the children’s section (how appropriate!) and we managed to secure a little alcove to ourselves, which was nice. N and I were so delightfully surprised by our gift bags. 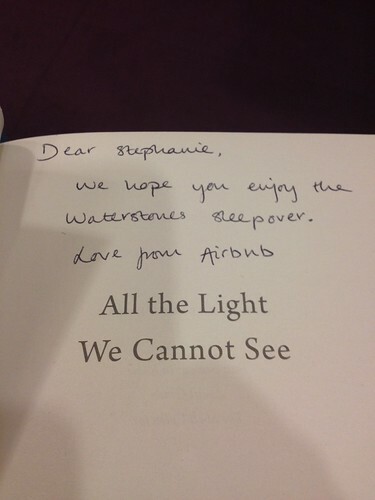 Waterstones and Airbnb honestly thought of everything we could possibly need–toothbrushes and toothpaste, small towels, soap, mugs, tea, booklights (!!! ), bookmarks, Graze boxes, bottled water… and so much more. Firebox sent across some amazing unicorn slippers. I have to say it was hilarious seeing N walk around in those all night! Of course, my bag had a copy of the book I chose for my competition entry, All the Light We Cannot See. How kind! 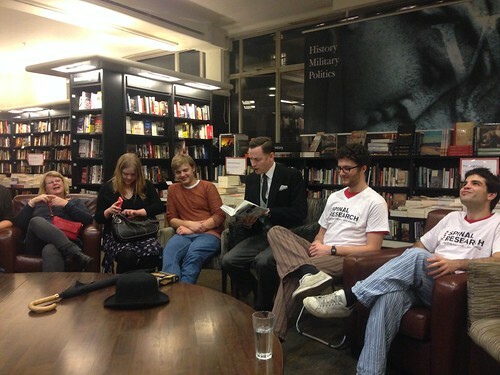 And that was one of the nicest things about the evening–just how nice everyone was. 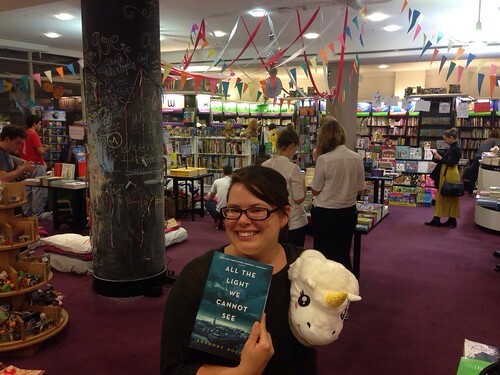 The Waterstones staff were brilliant and attentive, making sure everyone was comfy, offering book recommendations and just chatting and getting to know everyone. 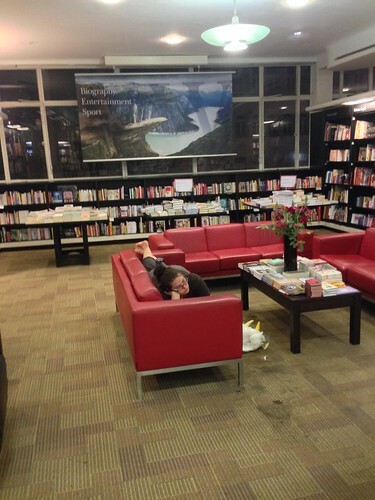 After we changed into our pjs, N and I wandered up to the third floor (cookery section, of course) where I parked myself on a couch and N browsed through various cookbooks. Though we wandered around a bit more, we kept coming back to this area as it was super comfy with couches and a plug to charge my phone (hey, I was constantly tweeting!). 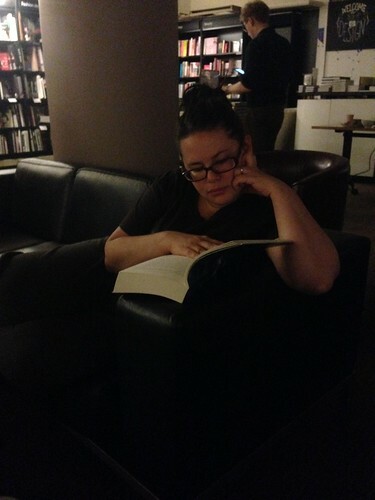 Glass of wine in hand, I settled in and started reading my book (which is amazing). Sending out another tweet, I’m sure. I did pick up various other books throughout the night so my book wishlist has grown ridiculously long. Finally, around 3.30, we hit ‘the wall’ and could barely keep our eyes open… especially knowing that we were babysitting N’s 3 year old sister from 10AM. We slipped into bed quietly, but there were a few people up with their booklights on. And that was our night done! 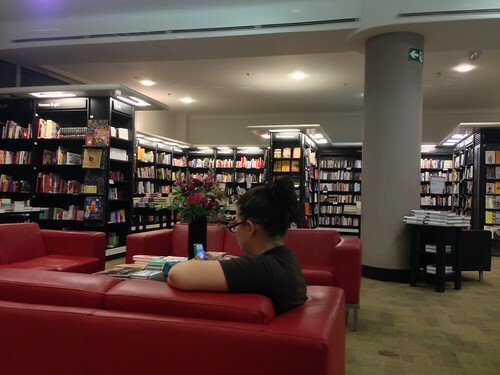 I have to say a big ‘thank you’ to Waterstones (and the folks at the Piccadilly branch) for sharing their amazing store with us. Airbnb were fabulous with the furnishings and Firebox’s slippers were the bees knees. 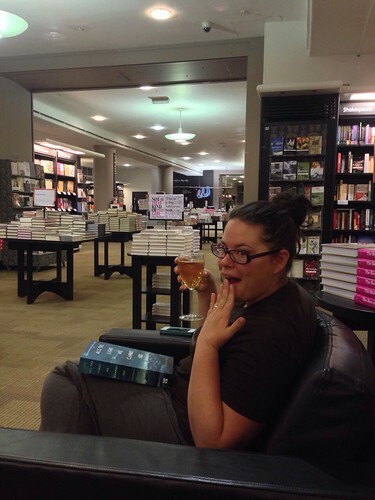 A massive ‘well done and muchas gracias’ to Sandra Taylor, Head of PR & Events for Waterstones. For someone who’s only been in the job a few weeks she did an amazing job throwing the whole thing together within a few days. What a night! Neither of us will forget the freedom and peace that came with wandering four floors of books in the middle of the night in our fabulous unicorn slippers. For more photos, check out my flickr album. 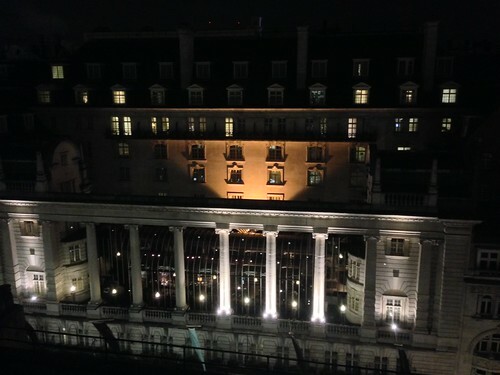 You can check out everyone’s tweets from the night here. 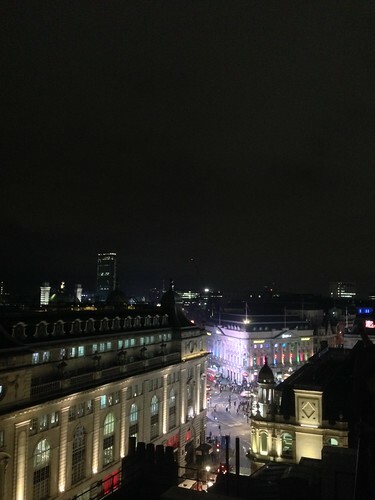 Oh and The Guardian were on hand as well–you can check out their wrap up of the night here. 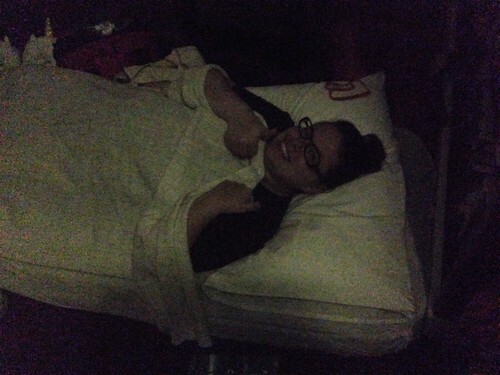 It really was such an amazing experience… and obviously a dream come true! It really was the coolest thing ever!